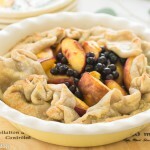 There are desserts, and then there are any day desserts, these really don’t require a recipe, you can quickly and easily put them together with simply what you have on hand, like Use up the Nectarines and Blueberries Open-Face Tart. 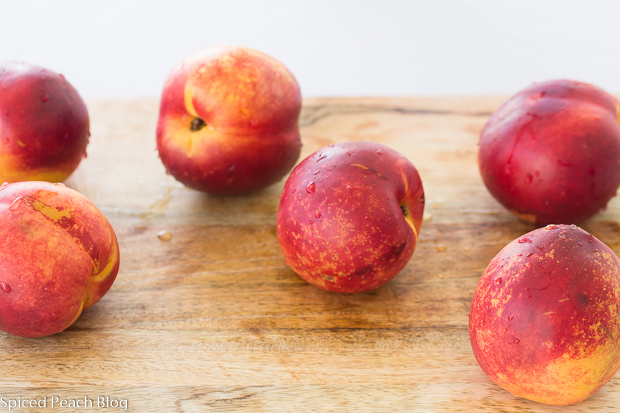 You could use nectarines, peaches, apples, any type of berries, or even fruits frozen from another season like rhubarb, there are many variations, it’s all up to you. Remember the old saying ‘easy as pie?’ Well this gets even easier just using a couple of store bought crusts, overlapping them together at the center and placing the created large sized crust into a lightly greased pie dish. Cut up whatever fruit you are using, and toss it with a bit of fresh squeezed lemon, enough sugar to cover, and a sprinkle of cornstarch to thicken things up a bit. Topple it into your giant sized pie crust. My Grandson, the J-Dude helped me to make this in maybe even less than ten minutes. Filled with fresh fruit, just bring up the pie crust sides and pleat all around, brush the top with some beaten egg, and finish sprinkling with some turbinado sugar. No need to be perfect about it, rather, the key is to simply use up and enjoy the ripe pleasures of what the season has to offer then relax and enjoy, it is after all, an any-day dessert. Lightly grease a large size pie dish. 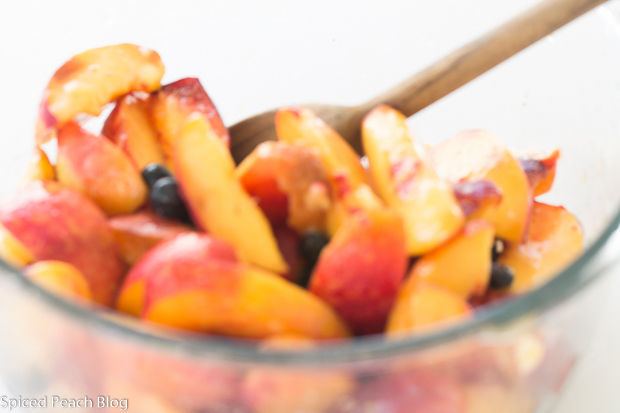 Toss together nectarines, blueberries, lemon juice, sugar, and cornstarch. Set pie crust rounds on lightly floured board, slightly overlapping and press down to connect, fit into a pie plate and bring up sides somewhat evenly around. Spoon fruit mixture into the center of the pie crust in the dish, bring up the sides of the pie crust and pleat all around, this is a great job for the kids and it doesn't need to be perfect. Brush crust with beaten egg then sprinkle over the turbinado sugar. Place pie plate onto a baking sheet and bake until golden brown all over, around fifteen to twenty minutes. 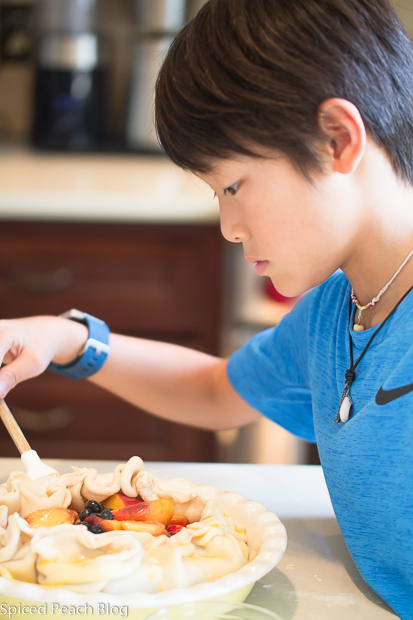 This entry was posted in Cooking With Kids, Sweet Treats and tagged Easy summer fruit dessert, Use up the Nectarines and Blueberries Open- Face Tart. 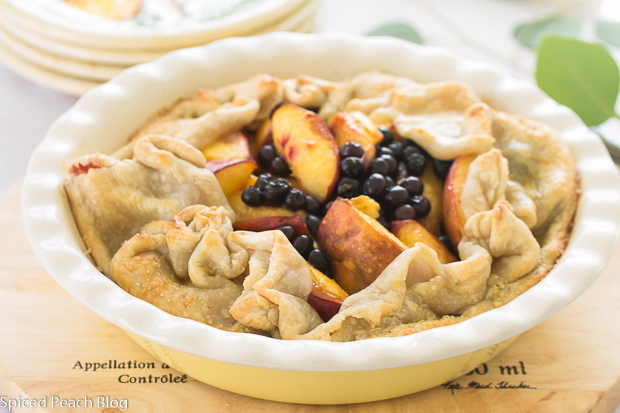 Nectarine and Blueberry Open-Face Tart. Bookmark the permalink. Post a comment or leave a trackback: Trackback URL. Love it! and that you can put the kids to work folding up the crust. 30 minutes here I come. Thanks Meredith, yep, an ideal easy project for kids and big people alike and a quick and delicious way to use up the fresh fruits of the sesaon, apple season won’t be long ahead! See you soon. Thanks again. This looks delicious Peg, thanks for the tip. See you on Tuesday night. As always thanks a bunch Joanne and I’m looking forward to seeing you on Tuesday night! Kelly recently posted…Happy Birthday Dad! Hi Kelly, Thank You. It is like a galette. I cannot take credit for the pleats as they were the work of the J-Dude along with providing the lovely outer crust, shiny and sparkled from the turbinado sugar-you just cannot beat it for a quick and easy dessert, especially while making the best of the seasonal fruits. I can’t wait to do it with apples! So excited to see you home! Love tarts like this Peggy, especially this combo, 2 of my favorites. Thanks Cheri! 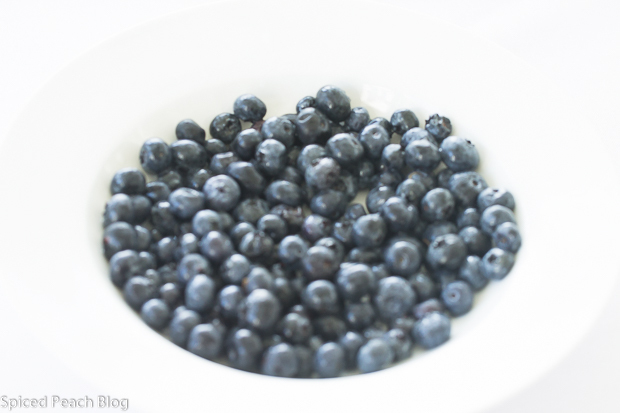 Love these quick fresh fruit tarts too!